Five of Cups card suggests that a person has seen better times and is currently under an influence of a spiritual crisis and emotional exhaustion. 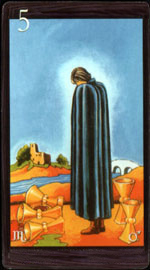 If this card happens to appear when practicing divination on personal relationships, the Five of Cups indicates that the person who performs the divination has extremely sharpened senses, he is in complete disarray and feels uncertainty and insecurity. Sometimes it’s not even just a sense of insecurity, but a real despair and then the situation is much worse. A reason for this kind of despair could be a big loss, in which the person himself is guilty. It may be lost opportunities or ruined relationships. If this card happens to appear when practicing divination on a business, the Five of Cups means that this person is not capable to bring things he started to a logical conclusion. This card tells about the impermanence of this person and that he doesn’t know what he really needs. Such a person at the very first difficulty will leave the business. Also, when practicing divination on a specific situation, the card means that nothing but disappointment will be received and that the expectations won’t be met. In relation to the Major Arcana, the Five of Cups increases all the negative influences of the negative cards. But in combination with good cards from Major Arcana, Five of Cups promises an end to the dark period in life and a beginning of a brighter future, and it means that you should immediately leave your fears, worries and sadness. A sudden change in a love relationship. In daily businesses – it may mean sorts of past failures. The traditional meaning of the Five of Cups card is frustration, tears and sorrow, grief, loss of feelings, a sudden drastic and painful awareness or an abortion. Additional Card Meanings: Frontier, conversion. A new perspective on life, hope, encouraging news, pleasant experiences, new alliances, communication, a return of an old friend. There are many obstacles along your path, pass them with honor. Don’t swim in your grief and don’t expect too much from the future. Today isn’t going to be easy for you. If you already enjoyed something or considered the case solved, then you are going to be disappointed today. If there’s only some little thing that went wrong, then take it with humor. If you have suffered a disappointment in a really serious matter, accept defeat with honor and don’t hide it from others. The more honest and sincere you behave, the more likely you will be able to find a new path.